Offshore equipment maker Aker Solutions, in conjunction with the Department of Engineering at the University of Agder, wanted to simulate the design of offshore machines before Aker assembled a physical prototype. Using MapleSim, Aker was able to construct a model by breaking the complex machine design into three different system models: mechanical structure, hydraulic actuation system and electrical control system. The final design in MapleSim integrated all three system models. 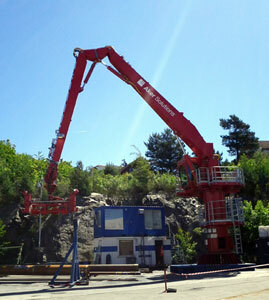 Aker was able to build a model of one of their existing cranes and validate that the model was able to accurately predict the dynamic behaviour of the real crane. By using MapleSim, the team found that the simulation ran much faster, saving time in the design process. The team is currently using MapleSim to determine the impact of substitutions or design changes to individual components, ensuring more accurate model designs in the future. A Norwegian university research project in partnership with Aker Solutions is using MapleSim models to predict the performance of complex offshore materials handling equipment. In the short term, the work is helping designers pick the best components for the job. Ultimately, it aims to automate more of the design process. With offshore oil and gas drilling rigs costing millions of dollars a day, their crews need to ensure they get the job done as quickly as possible. That job involves assembling the thousands of meters of flexible pipe that make up a drill string, and doing so safely and consistently on a remote platform where space is at a premium and weather conditions are frequently challenging. 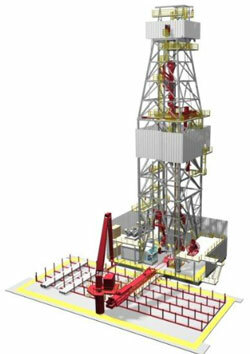 Modern drilling platforms make use of highly specialised materials handling equipment to ensure components are moved quickly, precisely and safely to keep the rig on schedule. Typically, this equipment is hydraulically operated, with most modern systems also incorporating a sophisticated electronic control system, which simplifies operation and permits a considerable degree of automation. 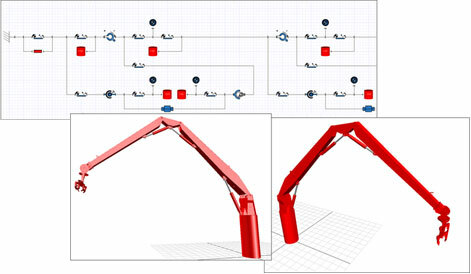 Designing such control systems is challenging because when a crane is in motion its dynamic behavior depends upon, among other things, the precise electrical and hydraulic behavior of the control valves, the performance of its hydraulic actuators, the inertia of the crane’s structure, its load and the complex interactions between all these components. This complexity not only makes programming a crane’s control system difficult, it also raises challenges for its mechanical and hydraulic design. Design teams must ensure that the hydraulic components they pick will deliver the required level of responsiveness, or ‘bandwidth’, while also considering a host of other factors including the cost, size and weight of components, their long term reliability, and ease of maintenance. An ongoing research project at the Department of Engineering of the University of Agder in Norway, carried out in conjunction with offshore equipment maker Aker Solutions, aims to simplify this formidable design challenge by allowing engineers to build and run detailed simulations of equipment before they assemble a single part. MapleSim, the system-level modeling tool from Maplesoft, is playing a critical role in this initiative. MapleSim is good for this work, he explains, because it combines an extensive library of standard elements with the ability to easily integrate custom parts. 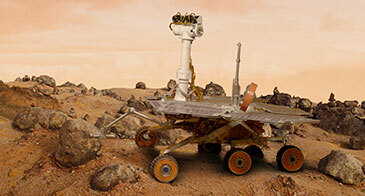 And this degree of customization is essential to achieve the accuracy and detail required for model-based design. To obtain the missing data, Bak has built custom models of key components, like control valves, and validated their accuracy by conducting tests on single components operating in isolation. Optimizing across hundreds of components and thousands of parameters would be time-consuming, difficult and unfeasibly dull for human designers, but a simulated model created using MapleSim can complete such a task rapidly and tirelessly. Even so, a viable system requires an efficient search algorithm and Bak plans to use the Complex Method. “In the algorithm, we populate the simulation with a number of randomly generated designs and it evaluates the performance of each,” he explains. “It then picks the poorest performing design and ‘mirrors’ it across the centroid of the remaining designs to produce a solution that should work more effectively.” This process is then repeated, with the worst performing design substituted each time, until the solutions converge on the optimum result. Initially, Bak is using stability and accuracy as performance criteria, and, consequently, the optimum solution is the design yielding the lowest level of oscillations in the hydraulic system and with the best ability to follow the position reference fed to the control system. Later Bak plans to add other criteria such as price, robustness and long term reliability. As the University of Agder project puts its models to ever more demanding uses, other aspects of MapleSim are becoming more important. 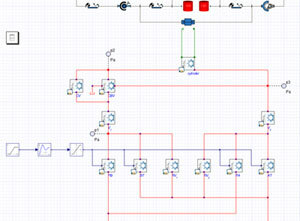 “I am using MATLAB® and Simulink® to run the design optimization algorithm,” notes Bak. “Since MapleSim offers a direct link to that package, it is easy to integrate the two parts of the work.” Design optimization also makes considerable demands on the efficiency of computing packages, since a single optimization may require hundreds or thousands of separate simulations. “MapleSim runs fast and seems to be computationally efficient and that is essential to keep run times down to a manageable level as we conduct larger and more sophisticated analyses,” he concludes.